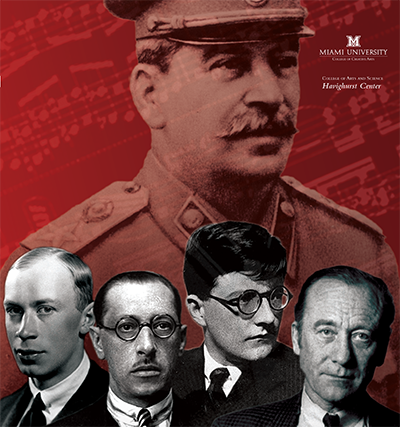 On September 14th and 15th in the Gates-Abegglen Theatre on Miami’s Campus, audiences will see the world premiere of Deceptive Cadence: Stories from Prokoviev, Stravinksy, Shostakovich, and Shchedrin. This multi-media performance piece features projection design, live music from a string quartet and piano, and actors portraying the composers and the women in their lives. This performance is sponsored by the Havighurst Center, and is a collaboration between Dr. Harvey Thurmer in the Music Department and Dr. Christiana Molldrem Harkulich in the Theatre Department at Miami. He brought his ideas about a collaborative performance to Dr. Harkulich, and they conceived of a show that would blend their department’s specialties together. Dr. Harkulich’s graduate students in Theatre, Mackenzie Kirkman and Kelley Feeman created the script for the piece using the words of the composers from the many diaries, letters, and books they left behind. Miami Alum Chyh Shen Low will return to Miami to play piano in the performance. The performance will also feature professional projection designer Joe Spinogatti’s work as a visual background for the piece. The result of this collaboration is an hour-long dramatic performance that will bring the world of these composers to life, in their own words and with their own music, as they explore the question: Who decides which art is good?